Scottish actor Robert Carlisle, star of Trainspotting, Hamish MacBeth and The Full Monty, appears in Johnnie Walker’s latest television commercial, talking about the history of the legendary whiskey. The TV advert lasts for six and a half minutes, including credits. The Walk begins with a sole bagpiper playing in the highlands, with a backdrop of mist and smoke. 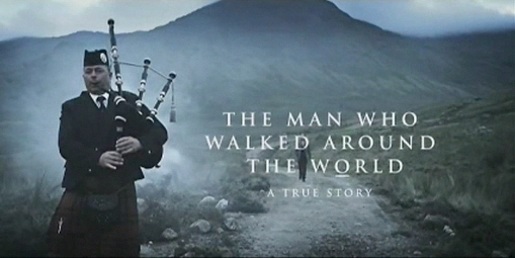 Robert Carlyle walks into the picture and tells the piper to “shut it” before launching into his 5 minute narration of the Johnnie Walker story. Along the mountain track Carlyle interacts with a range of props, picking up and putting down glasses and bottles of whiskey, passing a highland cow and even a bank of television screens. The Walk was developed at BBH London (Bartle Bogle Hegarty) by creative director Nick Mahoney, creatives Justin Moore and Jamie Rafn, and agency producer Ruben Mercadel. Filming was shot near Loch Doyne in Perthshire, Scotland in a single take (the 40th) by director Jamie Rafn via HLA, London, with director of photography George Richmond and producer Stephen Plesniak. Post production was done byVFX artist Glyn Tebutt, post supervisors Romilly Endacott and Diego Vazquez Lozano at Glassworks, London. Editor was Kate Owen, Marshall Street Editors. Sound was designed by Aaron Reynolds at Wave Studios, London. Music was composed by Jamie Masters at Adelphoi Music. Read more about the filming of the commercial at Shots.